I'm working on a MacBook (13-inch, Late 2009) 2.26 GHz Intel Core Duo. I'm unable to install two simultaneously. 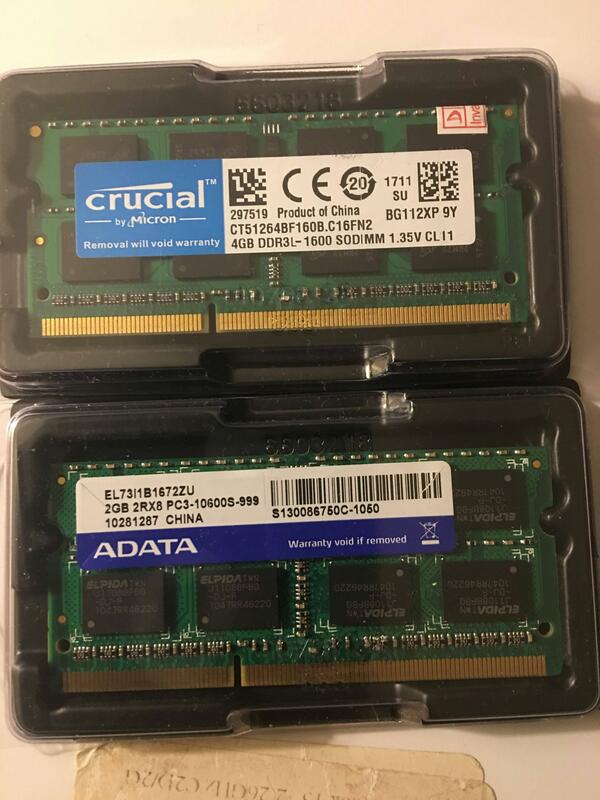 The modules (either one discounting a bad module) one of the pairs works correctly when paired with a 2GB 2RX8 PC3-10600S-999 (Memory Module B1,B2) by ADATA. Why would they work when paired but not simultaneously? The logic board supports up to 8 GB? The combinations are written below. My goal is to determine if I need to return the memory modules. Crucial own website says this memory is not compatible with your model Mac. I suppose this might be because officially your model Mac does not support 8 GB of memory. The simplest explanation for your problem is the Mac adjusts the timing based on the the memory installed. Most likely the ADATA memory is slightly slower thus causing the Mac run the Crucial module at this reduced speed. When both Crucial modules are installed, this restriction is lifted, but this causes some other timing conflict that prevents the memory from working properly. Crucial recommends DDR3 PC3-8500 memory for your Mac. I realize this module is not 4GB. From the image you posted, I assume the ADATA memory is PC3-10600. You bought Crucial DDR3 PC3-12800 memory. This memory does not even appear on CRUCIAL® MEMORY FOR MAC® SYSTEMS COMPATIBILITY CHART. According to this compatibility chart, you would want the CT2K4G3S1067M pair of modules. A good table comparing the different modules can be found here. Note: I have aways been annoyed that the older slower memory is often more expensive that the newer faster memory. Not the answer you're looking for? Browse other questions tagged macbook memory . What's the best memory upgrade option for a mid2007 macbook running 10.6? How to diagnose repeated OS X hang / spinning beach ball of death? Is the CT3309352 Crucial memory the same as CT2K4G3S1067M? Feasibility of swapping two MacBook Pros (both hard drive and RAM)? Mid-2012 MBP — put a 16GB SODIMM in one slot?